A kind gesture can go a long way but who would have thought that the kind acts of two Nova Scotia teens would start such a positive revolution? The teens bought + distributed 50 pink shirts after a male ninth grade student was bullied for wearing a pink shirt during the first day of school. This was the boys’ way of taking a stand against bullies. 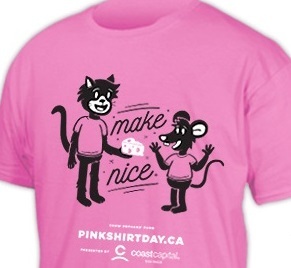 The concept gained traction and has become synonymous to standing up against all forms of bullying….years later the official Pink Shirt Day was introduced + every year the iconic pink shirts are sold + worn on Pink Shirt Day. The shirt changes each year in both design + message. But whether the message is “Bullying Stops Here”, “Kindness is One Size Fits All”, or this year’s, “Make Nice”, the point is clear…. bullying is bad + affects everyone. The good news is that during the past few years there has been a shift in our society – campaigns have been created to bring more awareness in an attempt for peace and people find themselves being more thoughtful of their actions. We ask that you all be mindful of your actions and invite you to join the cause. 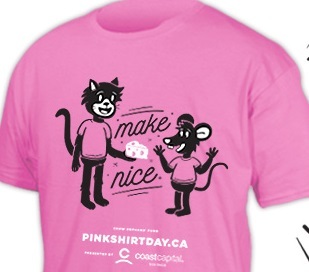 Raise awareness by wearing Pink on Pink Shirt Day – shirts, scarfs, socks, hair pins, lipstick, wrist bands, shoelaces, earrings, ….or, the official Pink Shirt Day T-Shirt. It doesn’t matter how you to choose to “think pink”….it only matters that you do! Visit us at any Take Five Café + show your pink. We will all be wearing the official Pink Shirt Day t-shirt + look forward to seeing you on Wednesday February 22nd, 2017.